Yes - its finally here. That 'One Sunday in Hell" that each year we wait anxiously for, and pray for rain. There is simply no other race like it. 257km long, with 29 cobbled sections totalling 54.5km ... and the cobbles are very different to those of Flanders that the riders have spent the last 6 weeks riding on. These are the cobbles of France ... they are big, mossy, slippery, rough and hard. 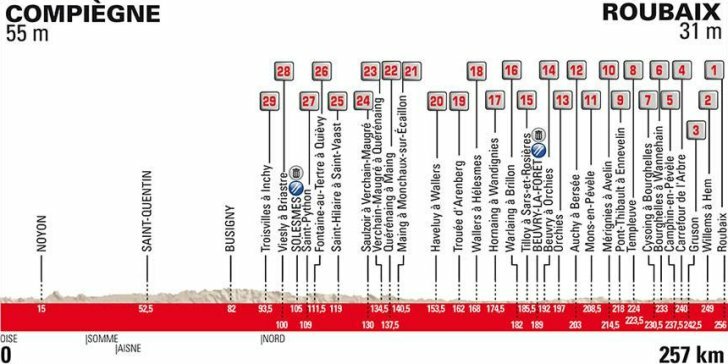 Each cobbled section is rated ... lowest of 1 star to the super difficult 5 star sections such as the Forest of Arenberg - which is where things traditionally kick off. Mind, the race for position heading into the famous trench is almost as hectic as the finish line of any other race. The finish - who doesnt dream of a solo celebration lap around the velodrome of Roubaix, with the coolest trophy in cycling waiting for you. 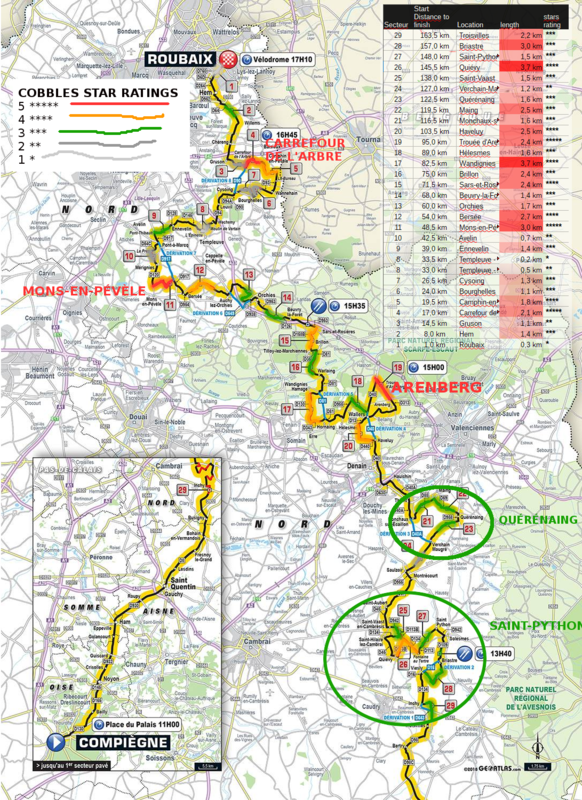 This year we have 257km, with 29 sections of cobbles. Like the rest of the spring, the might of the Quickstep team will prove to be a huge factor in determining this race. Can anyone overcome their pure weight of numbers? Will Sagan, Van Avermaet and the other contenders be able to work together? Van Avermaet comes into the race as the defending champion, and in good form - but not the super confidence-inspiring winning form of last spring. Still, he is in good shape, and if things go right for him he could find himself with back to back wins here. Sagan too is that tiny bit off his best shape - but perhaps that might work to his advantage if other riders figure that finally they might have a chance and might work with him. He comes here with a better team than he has ever had - but made mistakes in how to deploy them at Flanders so needs to do better here. And then there are lesser favourites that are strong, train hard and desperately want this ... who only need that bit of luck going their way to make their mark. 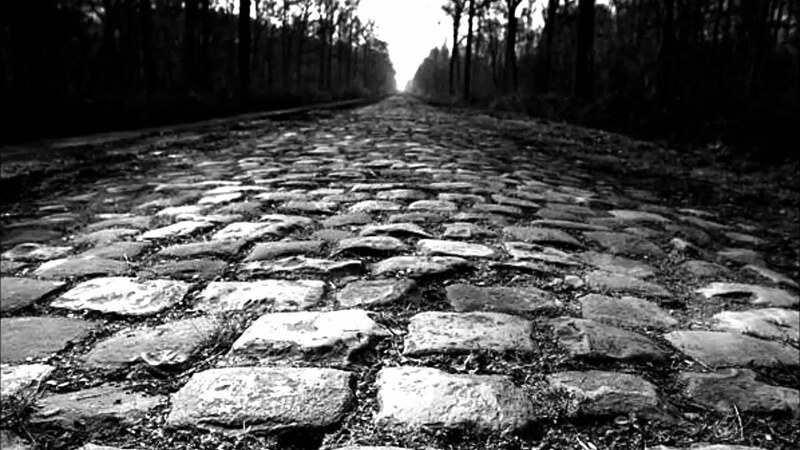 So - who's dream will come true ... and who's dreams will lay broken on the cobbles of France? Dry, overcast and 19 Celsius on Sunday. No epic rainy edition this year. The wife said might take the kids with some friends they can cook some sausages play outside. You want to come. Me might do some stuff at home. Wife ok cool see closer to Sunday. ...big, mossy, slippery, rough and hard. The worst Tinder profile ever. You trying to get yourself banned from Velorooms, or something? As difficult as it has become over the years, I'm really going to try to find a decent live feed on Sunday. Not that it matters in the grand scheme, but it appears that there is only one, solitary American rider even entering the race this year—Taylor Phinney? After winning the junior race twice, he was never a threat in Roubaix as a pro. I haven't been following along, so is he even healthy? Has he accomplished anything of note this season that would put him on anyone's radar? Truth be told, I hadn't even realized he was still even riding professionally. No wonder American TV is giving zero priority to Roubaix this year. I also think he's not beating himself up about that, but has accepted this 'fate', enjoying to be a classics super-domestique instead. And painting some paintings in his spare time. 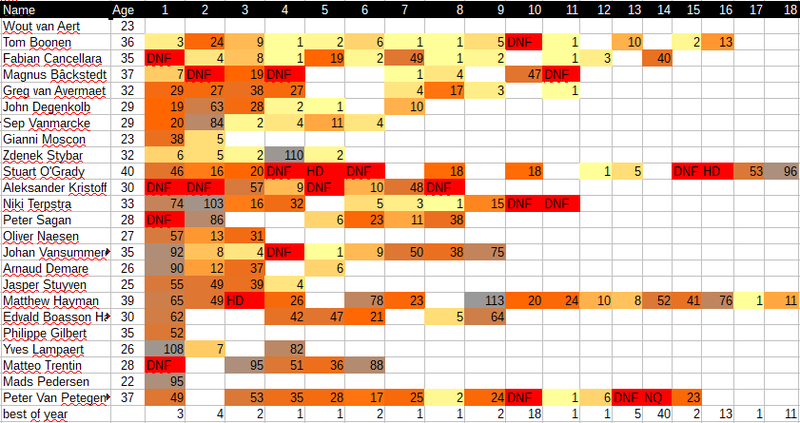 The secteurs are color coded according to difficulty (star rating) + added a few key names for reference. If you see Matt Hayman sneaking away on one of these sections ...it's his last lap! He's the most experienced rider here now, and he won one of the most exciting vintages of the last few years, on the velodrome! Be warned! Or, actually - I don't think it is that bad I agree that Terpstra is top favorite, he knows how to win here, he is in very good shape and he rides for the best team. Sagan, Van Avermaet, and Gilbert should also always be included as candidates. However, further down the list I am less certain. 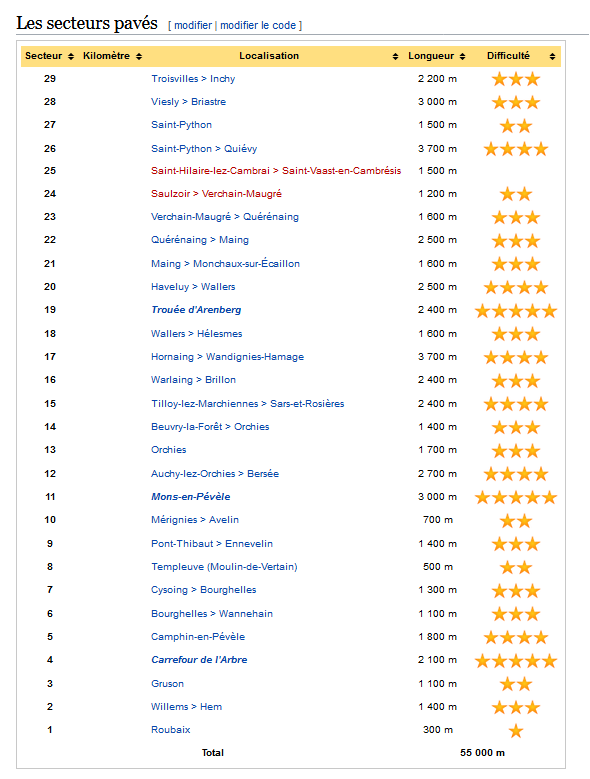 Statistically, the Paris-Roubaix is the most difficult to win of all the monuments. There are very few if any in the past 10s of years that have won the Paris-Roubaix without previous experience from the race and at least one top 10 finish. Filtering Het Nieuwsblaads list by that criteria will be hard on the young ones on the list. EDIT: surprised me a little bit too see how few top results Sagan has in this race. Moscon already has better results than him! Most open race for a while in my opinion. Just can't call it. Wouldn't say they might be a bit partial, eh? With everyone looking at Quickstep (and Sagan?) I really like the chance of an outsider to win today. And it will be especially interesting to see what happens if Lampaert or Senechal manages to get into an "early" move - are BMC, Bora and EF willing to give Terpstra, Gilbert and Stybar and armchair ride into the finale? ...and talking about outsiders: there was an interview with Damien Gaudin in Ouest France today and he said "with Chavanel, [Petit and me,] we have three protected riders for the win. Just like Quickstep.". Not sure if that's a fair comparison... but anyway. Let the green army role like it's 2013. I notice Thomas has said that this (type) of race is where his heart lies. He needs to get a grip and have a word with himself because a couple of years ago it was all about being a stage racer. I think he's a better one day racer than stage racer (also less chances to crash if you're only racing for one day). I'd like to see him commit to being a classics racer going forward. Here's some statistics for you, this is why I say no-one wins this race first time they try. The racers listed include some of this years favorites and all winners from the last 15 years. The results are listed per year from the year of their first participation. None of the winners won until the 4th year after their first participation. Both Boonen and Cancellara won their first victory in their 4th participation. If someone wins it first year, they will be nominated for instant league of legends status! I also heard, and recounted, that in order to win in this race, you need at least 1 top 10 finish earlier. For the winners from the last 15 years, that is almost true. Stuart O'Grady won in 2007, without a previous top 10. Now there's a lot of hype surrounding Wout van Aert especially, but I hope his management has done a good job of making him understand that a victory is highly unlikely, a top 5 is an exceptional debut (only Boonen managed this), and a top 10 is a very good start (Boonen/Bäckstedt/Stybar). If van Aeart really thinks he is going to win this, I hope he thinks "but maybe not this year". Stybar could have come pretty close to winning it as a rookie hadn't he crashed into that spectator late in the race though. According to ProCyclingStats, Cancellara participated in 2003 with DNF result, so he should not be on that list, if that is correct ? You're quite right when it comes to Stybar, his record is the only one of the present bunch that looks like it can come close to a Boonen/Cancellara statistic. With the hype surrounding van Aert, consider that Stybar matches him on CX experience and then has the Paris-Roubaix experience in addition. Then look at Philippe Gilbert's statistics in this race; he is more or less at the same level as Mads Pedersen. (Take away stars from van Aert, Gilbert, give to Stybar ).